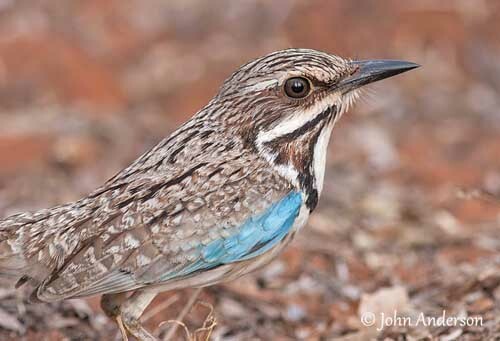 The ground-rollers are found only in Madagascar. The Long-tailed Ground-roller has very restricted range regarding the four other species of this family. This one is the sole member of the genus Uratelornis due to several differences both in appearance and behaviour. 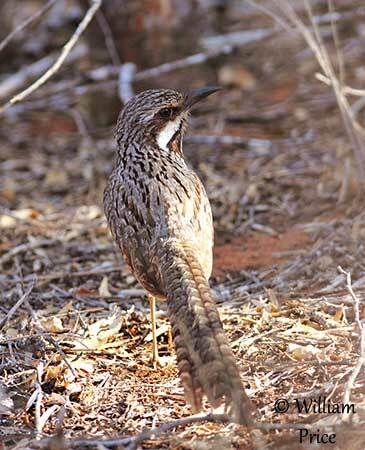 The Long-tailed Ground-Roller is endemic to Madagascar where it has very restricted range in SW. It frequents sub-arid thorn-scrub and deciduous woodland whereas other ground-rollers prefer the eastern evergreen rainforest. It has greatly elongated tail feathers and distinctive head pattern. It feeds on a variety of invertebrates, small reptiles and frogs. It is solitary nester and excavates a burrow in the ground, with a nest-chamber at the end where the eggs are laid. They are monogamous and territorial during the breeding season. 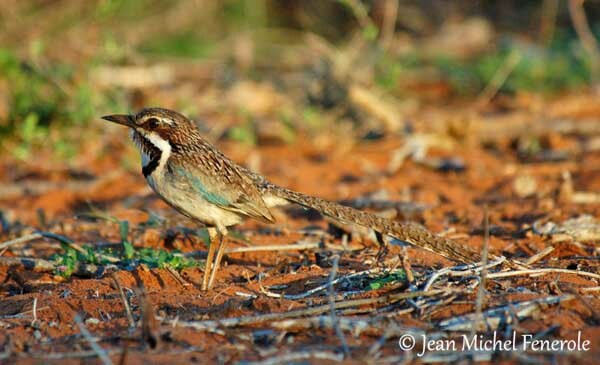 The Long-tailed Ground-Roller is threatened by degradation of the habitat, predation by dogs and introduced Rattus rattus, and hunting. It is currently listed as Vulnerable. The adult male has dark sandy-buff crown and upperparts, streaked dark brown and black. The long tail shows 15-20 dark brown bars, and the outer rectrices are pale blue. On the upperwing, wing-coverts, including greater primary coverts, are pale blue. They are well visible in flight. The underparts are pale greyish-white with whiter breast. The undertail is whitish too. On the head, the supercilium is pale buff whereas ear-coverts are brown. We can see a conspicuous white moustachial stripe, bordered by brown and black malar stripes. There is a black breast band bordering the white chin and throat. The bill is black. The eyes are brown. Legs and feet are pale pinkish-brown. The female has similar plumage but she is smaller with shorter tail and narrower breast band. The juvenile resembles females but duller. 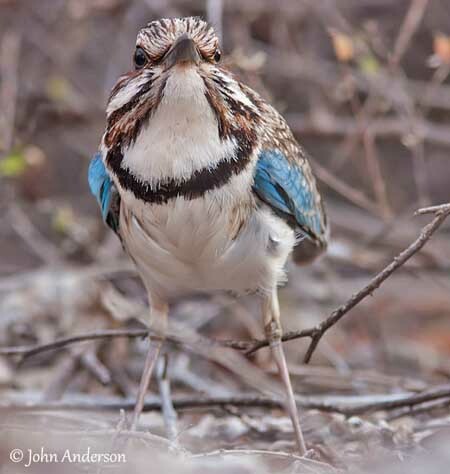 The Long-tailed Ground-Roller has very restricted range, a narrow coastal area in the SW of the island and a unique habitat type between the Fiherenana and the Mangoky rivers. This area of thorn-scrub forest is only 70 km by 200 km along the coast. 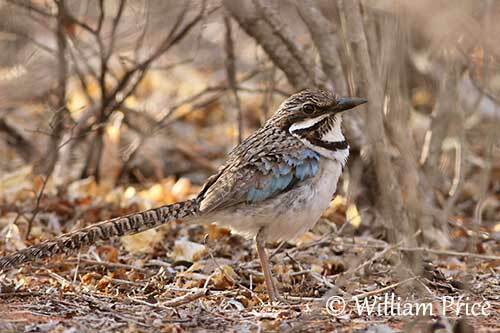 The Long-tailed Ground-Roller inhabits sub-arid thorn-scrub and deciduous woodland, whereas the four other species of the family prefer wetter forests. Its habitat includes cactus-like tree-species on sandy soils and with thick leaf litter. It occurs in narrow coastal trip in SW of the island. This species is visible from sea-level up to 100 metres of elevation. 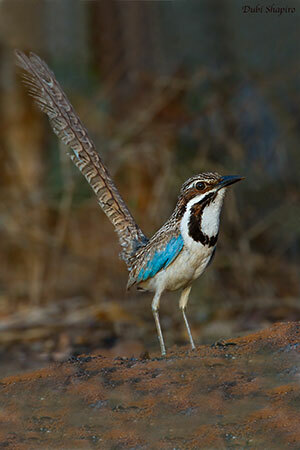 The Long-tailed Ground-Roller gives a series of soft notes “boobooboo…” or “too-tuc too-tuc too-tuc…”. These sounds are used as territorial calls and are given often before sunrise. But they are also uttered in the early morning and sometimes in the late afternoon, and even at night. These calls sometimes end in a loud snapping sound made with the wings. The territorial calls are usually delivered from perch, and territorial neighbours often interact through countersinging when the birds respond to each other. The contact call between mates is a low “gu” or “guguuguu” uttered while foraging or near the nest. When excited, they give a variety of scratching notes. This species is usually silent outside the breeding season. The Long-tailed Ground-roller feeds mainly on invertebrates such as ants, beetles, butterflies, caterpillars, cockroaches, grasshoppers, woodlice and also worms, small reptiles and frogs. This species feeds almost exclusively on the ground. It may stand motionless during long periods and then, it performs active foraging. It often lifts and lowers the tail while foraging on the ground. It is powerful when running, but it is a poor flier, hawking sometimes butterflies in the air. This species is active at dawn and dusk, but also during the night. 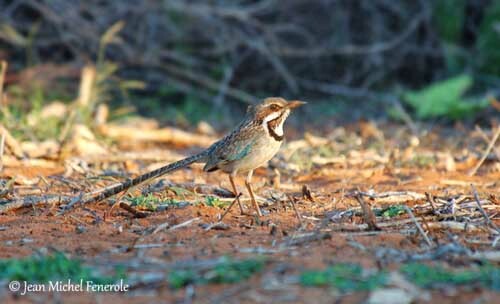 Although being largely terrestrial, the Long-tailed Ground-Roller roosts in trees or shrubs and sings from perches. It defends a small territory around the nesting burrow during the breeding season. 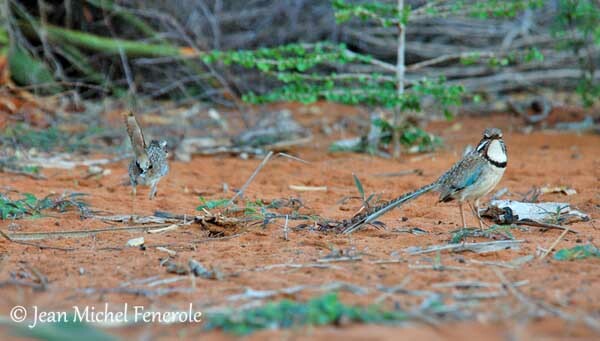 They form monogamous pairs during this period, but they are usually solitary the rest of the year during the dry season. While calling for the territory, the bird bobs the head downwards and performs an upwards flick of the long tail. When it is excited, the tail is raised vertically. It the bird is threatened, the tail is usually held well closed. Courtship displays are poorly known, but we can imagine that the long tail plays a role, being regularly cocked and fanned. In the same way, head, breast and wing patterns are probably exposed through several postures and movements accompanied by calls. A great variety of sounds are associated with courtship. The male is known to feed the female during this period. 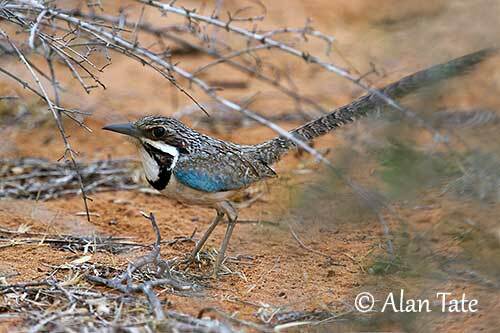 The Long-tailed Ground-Roller is usually sedentary with some short movements between May and August. This species has mainly terrestrial lifestyle, and it is often reluctant to take flight. 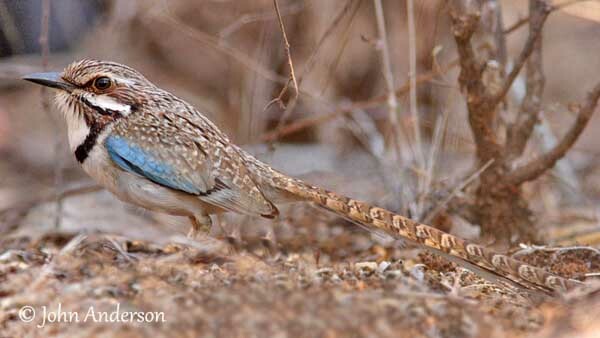 These birds prefers to run away when alarmed, reaching the cover of vegetation to escape danger. It is able to travel short distances with quick, direct and noisy flight in order to catch some preys, hawks insects or escapes predators. The breeding season occurs between October and January at the beginning of the rainy season. The Long-tailed Ground-Roller nests in burrow in the ground. Both mates excavate the burrow with bill and feet. They dig a downward-sloping tunnel in consolidated sand without any grassy vegetation, at the edge of a small clearing or along a track. This burrow can be 0, 80 – 1, 20 metre long with a diameter of 8 cm. The nest-chamber is at the end of the tunnel, with a diameter of 20 cm. It is lined with dry vegetation. The female lays 2-4 white eggs. There is no available information about incubation period. However, a fully grown juvenile has been observed in late November, and three more in late December. They fledge 24-26 days after hatching. They remain in family groups of 4-5 birds during the post-fledging period. During one season, the pair may excavate several burrows, one to six, always situated within 50 metres from other nests excavated by the same birds. The Long-tailed Ground-Roller has very restricted range, and deforestation for agriculture expansion and charcoal production are increasing. This species is adapted to degraded habitats, but such deforested areas are not completely occupied by them. In addition, this secretive bird is preyed upon by dogs and introduced rats. Egg-gathering and hunting by humans must be added to the precedent threats. The population is roughly estimated to number 30,000/35,000 individuals, and it is suspected to be declining due to the previous threats. 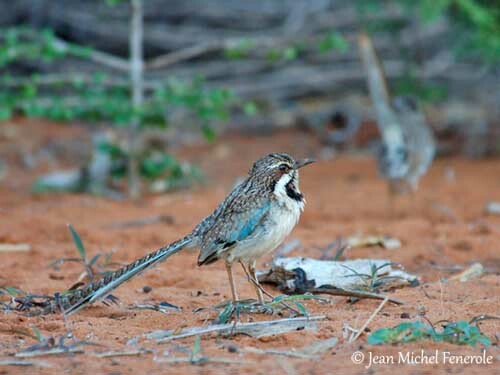 The Long-tailed Ground-Roller is currently listed as Vulnerable.